Bali Island well known as an island of the god, Thousand of Temple or Heaven Island and a lot of name given by people in the world who have ever been in Bali. Bali Island is strategically located in the tropical situation and the geographically of this island is consisted of mountain, valley, lake, flat area and beautiful white sandy beach and warms blue seawater. Bali Island is also well known, as an island owns rich of cultures, beautiful Balinese Dances and magnificent landscape panorama from the top hill down to the sea. This is Nusa Dua Bali - Indonesia. Let's Travel to heaven in one island of Indonesia. Nusa Dua is an elite resort area with international five star hotels and resorts existing on the costal side in south part of Bali. It is located in Badung Regency and about 25 minutes drive from Bali's International airport. Nusa Dua with 350 ha size is the sample luxury resort area and one of best tourism places in the world. In fact, the name of Nusa Dua is coming from two small islands located in the south part of Bali Island (Nusa mean the island and Dua mean two) that is dissociated with the white sand. Nusa Dua Area is start built in year 1974,as a result from study of French consultant, SCETO ( Societe Centrale pour l'equpeent Touristique Ouetre-Mer) in the year 1970 and also feasibility study conducted by PCI (Pacific Consultants International) year 1971-1973 for financing of World Bank aid. The Indonesian Government has delivered this area management to PT. BTDC (Bali Tourism Development Corporation) which existing under the law and regulation of Republic Indonesia Government no.27 year 1972, on 12 November 1972. This area owns the most complete tourism facilities in Bali and Indonesia like five star hotels, luxury accommodations, villas, convention hall, shopping center and beautiful beaches. The five star hotels exist in this area are Club Med, Nusa Dua Beach Hotel, The Westin Resort, The Laguna Resort, Melia Bali Villas and Spa, Inna Putri Bali Hotel, The Ayodya Resort, Kayu Manis Villa, Nikko Bali Resort and Spa, The Bale Villas and Novotel Nusa Dua. There are also the sports activities are available in this are like tennis court, squash and golf course. Each hotel is completed by five star restaurant facilities, bar, pub and beach activities. 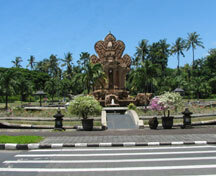 Nusa Dua is an ideal place for holiday in Bali.